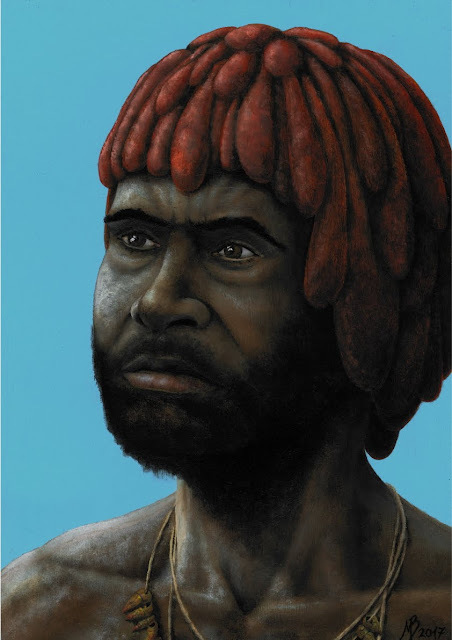 The picture shows a male Tasmanian, member of an ethnic group exterminated by european settlers during the 19th century. The last "full-blooded" of them, Fanny Chochrane Smith, died in 1905. The man has dressed his hair with red ochre, which was common at the east coast of the island. The necklace is made from sea snails of the species Phasianotrochus bellulus, which was evidentially used by Tasmanians. Furthermore the tasmanians had very scantily clothing, not exceeding kangaroo fur. They didn't know the art of tatooing, but scarification was done on parts of the body, like on the chest or shoulders.